The Woodstock Hotel in Pahalgam has been a strong player in the hotel industry since 1928. Ever since the hotel was established, its luxury services have been serving the guests in the best possible manner. Thus, the contemporary amenities and warm hospitality can be considered as one of the leading factors behind the success of the Woodstock Hotel. Presently, the visitors consider this hotel among the most fabulous luxury resorts in Pahalgam, and certainly the hotel has rendered best in class services for earning this stature. Accommodation Snuggled in the exotic landscape, the Woodstock Hotel provides some very spacious and cozy accommodation options to its guests. 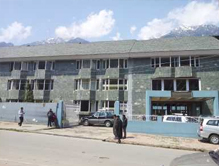 The hotel has fully furnished Deluxe Rooms that are known for providing an awe-inspiring vista of the Pahalgam’s beauty. 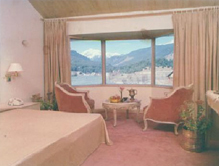 Further, the next option that the Woodstock provides is the ultra-luxurious Kashmiri Rooms. Unmatched comfort and interiors carrying a royal essence are the two major USPs of these rooms. Moreover, both Deluxe and Kashmiri Rooms have been facilitated with all the important amenities like attached bathrooms with 24-hour running hot water, wall-to-wall carpet, LED TV with cable connection, 24 hour power backup and telephone. On the top of it, round the clock room service ensures that the visitors enjoy every moment spent during their stay at the Woodstock Hotel. Dining The multiple cuisines offered at the hotel makes the guests simply fall for it. Right from the aroma, to the taste, to the aftertaste, the grub is finger-licking-good. Perhaps, that is why no guest can resist himself from giving complements to the chef. Further, the place where this food is served is embellished aptly to create a soothing ambience. As, perfect lighting and stylish furniture add to the overall dining experience. Do you wish to enjoy the luxuries offered at the Woodstock Hotel? If you nodded your head in a yes, then allow Tour My India to help you. We will assist you in making an effortless booking at the Woodstock Hotel, and that too at the most affordable price. Thus, you just need to contact us for enjoying a deluxe stay in Pahalgam.